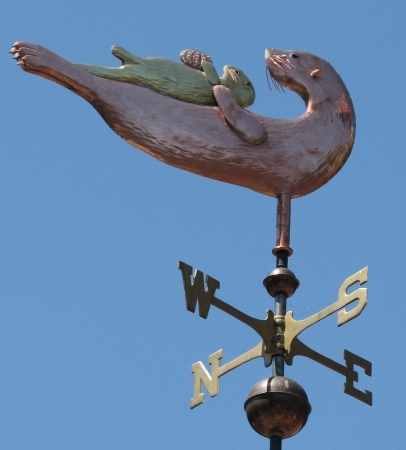 Our Sea Otter Weather Vanes, Enhydra lutris, are quite popular here in California. 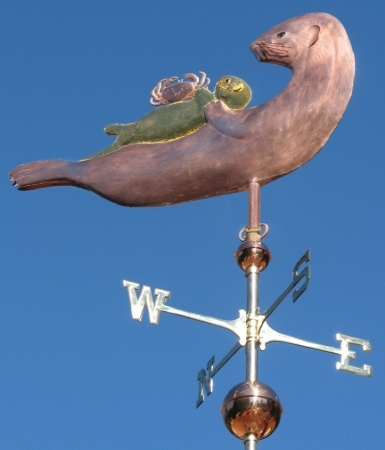 This Sea Otter with Pup Weather Vane was originally commissioned by two proud parents after the birth of their first child. They enjoyed watching these furry mammals and their babies frolic in the kelp beds from their home overlooking the Pacific Ocean. 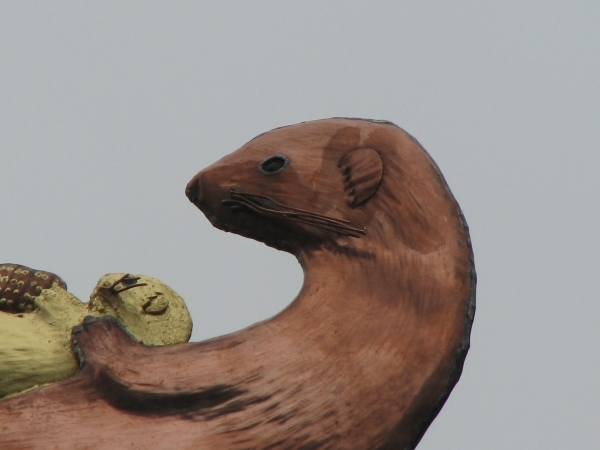 There is a tradition in weather vane making that ‘lucky’ pennies be inserted into individual weathervanes during construction. 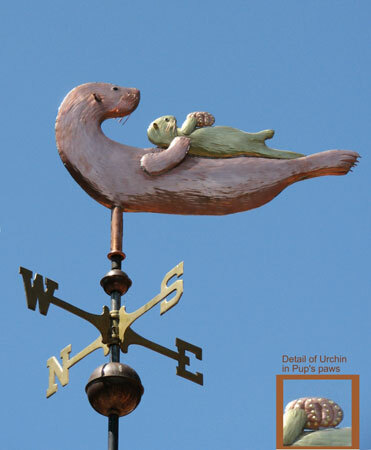 In the case of this Sea Otter with Pup Weathervane we included special pennies from birth years of the mother and father in the parent otter and a penny from the year their son was born (and the year the weather vane was made) inside the pup. They also requested optional gold leaf to highlight the pelt of the pup. 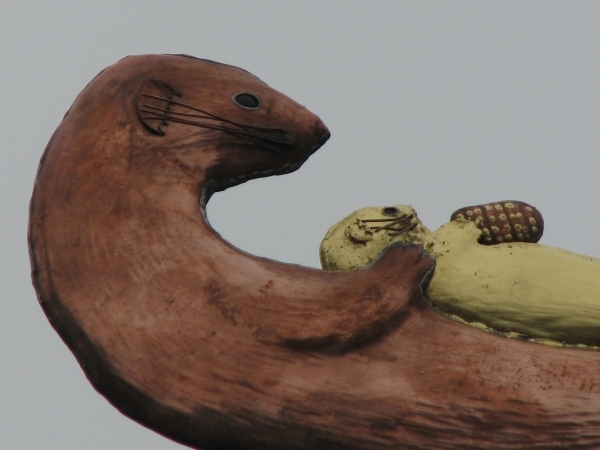 We left the parent otter natural copper and it will patina a dark brown when exposed to the weather, eventually matching the fur color of the actual animal. 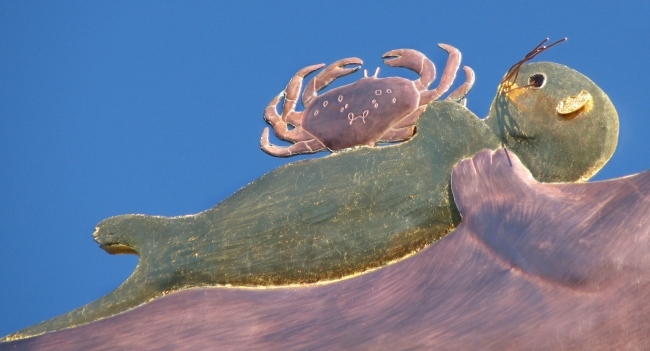 Because we make these weathervanes to order you can also choose to have the pup hold an abalone shell, a crab or a starfish instead of the sea urchin featured here. All three choices are favorite foods of the sea otter. The price is the same no matter which you choose. 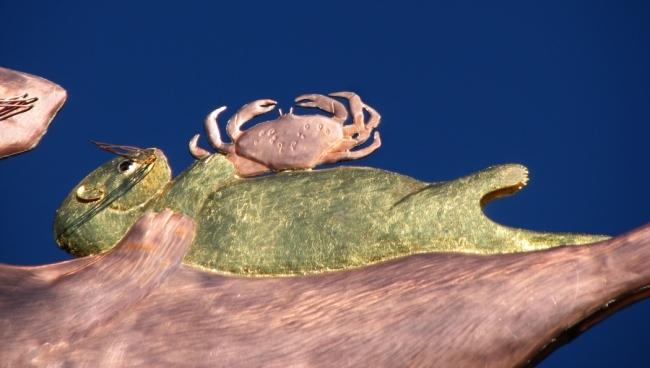 We can also add optional gold leafing to the star fish, shell, or urchin. The sea otter is a marine mammal native to the coasts of the Northeast Pacific Ocean. Adult sea otters typically weigh between 14 and 45 kg (30 and 100 lb), making them the heaviest members of the weasel family, but among the smallest marine mammals. Unlike most marine mammals, the sea otter’s primary form of insulation is an exceptionally thick coat of fur, the densest in the animal kingdom, and although it can walk on land the ocean is its primary habitat.